Numerous headlines have claimed that we are facing a “retirement crisis,” and that most Americans are not saving enough to maintain their standard of living in retirement. But what if there is no retirement crisis in the United States at all, and instead just a survey crisis? That is the conclusion of an increasing number of experts, who have combed through the data and found that, in reality, most seniors are doing quite well relative to the working population. The reason for the perceived retirement crisis, they argue, is bad data. In particular, the popular "Current Population Survey" (CPS) appears to be seriously flawed when it comes to capturing retirement income, especially income from individual retirement accounts (IRAs) and defined contribution (DC) plans like 401(k)s.
Source: Brady et al. "Using Panel Tax Data to Examine the Transition to Retirement"
Where is all this income coming from? Nearly half of individuals are still working and earning a salary three years after claiming Social Security, showing that retirement isn’t as binary as it is usually portrayed as. 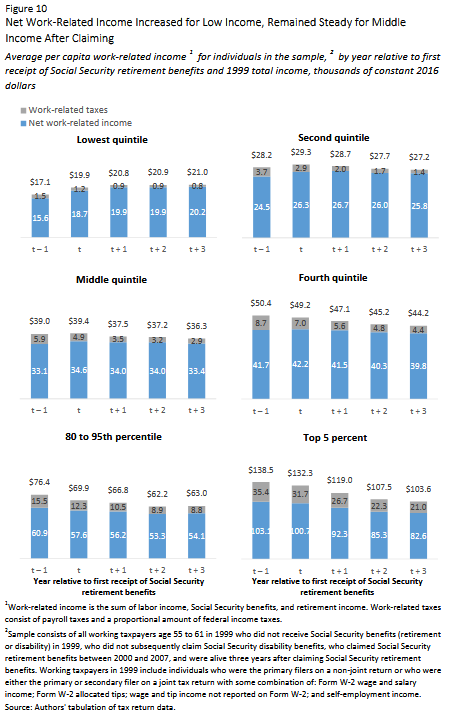 Social Security represents a substantial share of income for the bottom quintile but is less important for higher-earners—reflecting the progressive nature of the benefit formula and the fact that higher-earners have many other sources of income—whereas private retirement income is less important at the low end but is more important for middle and upper-income groups (those at the very top mostly rely on investment or business income). The second paper, authored by Adam Bee and Joshua Mitchell of the U.S. Census Bureau, matches IRS and Social Security Administration data to the CPS and finds that older Americans have higher incomes than the CPS alone shows. The CPS only captures around 45 percent of retirement income from IRAs and employer-sponsored plans, and the underreporting has gotten worse over time. Moreover, this missing income is widely distributed across the income spectrum and among different demographic groups. 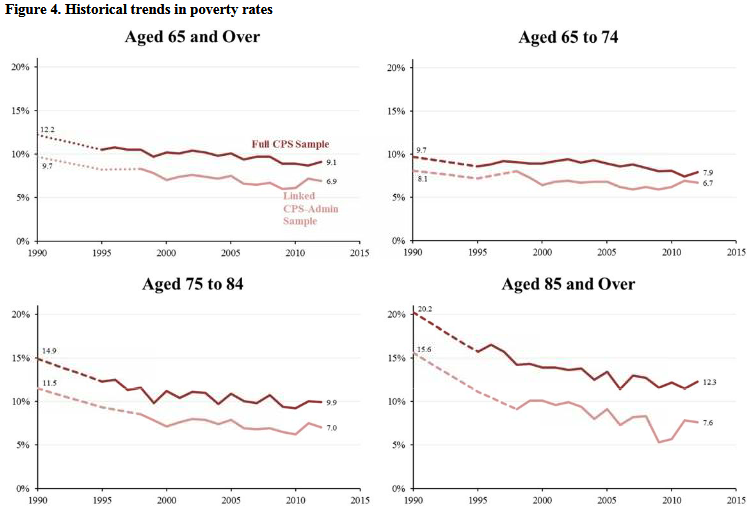 Total median income in 2012 for those 65 and older is about 30 percent higher than the CPS suggests, while the poverty rate for this group is 6.9 percent rather than 9.1 percent. Interestingly, while previous research had established that the CPS doesn’t fully capture irregular withdrawals from IRAs and DC plans, the authors find that the CPS also seems to miss a substantial share of traditional defined benefit (DB) pension income. Larger retirement incomes mean that today’s retirees are less dependent on Social Security than frequently cited statistics that use the CPS suggest. While the CPS shows that Social Security is practically the sole source of income for over one-third of seniors, the authors estimate only about one-sixth of seniors rely on Social Security for at least 90 percent of their income. Source: Bee & Mitchell, "Do Older Americans Have More Income Than We Think?" These studies join a growing body of research showing that most older Americans are not facing a retirement crisis. Andrew Biggs of AEI has written extensively on this topic, pointing out that retirement savings have risen as a share of annual incomes, and that most retirees are able to replace most of their pre-retirement incomes. Other studies have estimated that a large majority of older individuals are adequately prepared for retirement. Maybe that is why most retirees report they are able to live comfortably in retirement. Gaps certainly exist, particularly among certain vulnerable groups, but the problem is not widespread. Importantly, these studies only tell us about how current retirees are doing and don't try to make projections about the future retirement landscape—though there no evidence net retirement savings have been reduced. Still, they have important implications for public policy as it pertains to underfunded old-age entitlement programs like Social Security and Medicare, as well as the tax treatment of retirement plans and savings accounts. If there were a widespread retirement crisis, there would be a better case for allowing real Social Security benefits to continue to grow year after year, as is scheduled (the case for further expanding benefits across-the-board would still be quite weak). But these and other papers based on good data make it clear that the share of Americans facing major financial hardship in retirement is much smaller than many think. Given that Social Security faces a substantial funding shortfall and that most workers don't appear to face a retirement crisis, there is a strong case for gradually slowing benefit growth, particularly for wealthier workers who are currently slated to receive millions in lifetime benefits despite being able to live comfortably off their private retirement savings. Along with Medicare and tax reforms, these types of adjustments can help fix our national debt create fiscal space to redirect resources toward policies that will grow the economy and help those truly in need.